Does your New Year's resolution have to do with Emergency Preparedness? 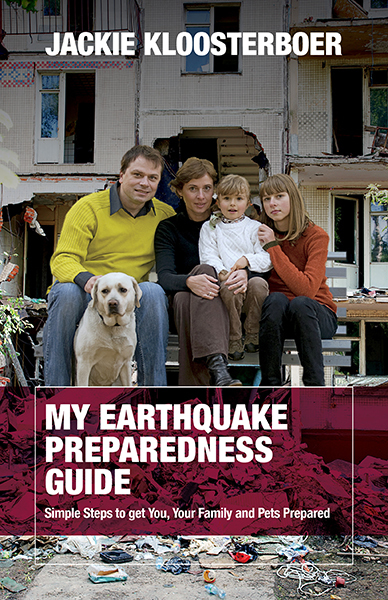 Jackie Kloosterboer's book, My Earthquake Preparedness Guide, would be perfect for you and loved ones. Jackie is the Coordinator of the City of Vancouver’s Public Education Program and received the Queen's Jubilee Award for dedication to helping people during times of a disaster. She has been a leader in Emergency Preparedness for over 15 years with a team of hundreds of Vancouver Emergency Social Services volunteers, and regularly teaches sessions to individuals businesses to raise awareness. Click here to WIN YOUR OWN COPY of the book! We believe that the time to be prepared is now and as Jackie states in her book "the hardest thing about not having an emergency plan in place is trying to explain to your family why you failed to prepare." We want everyone to become prepared, so Jackie and Life472 are giving away 4 copies of the book on Life472's Facebook page! Enter here! We're also really excited to be able to offer My Earthquake Preparedness Guide in the Life472 online store. Click here to purchase it now! Click here to visit Jackie's website to learn more about the author.